So the fluids within the game are measured in somewhat arbitrary units, for the most part is doesn't matter so much which units the volume is measured in. However over the past couple of major versions there has been some back and fourth about how we count these units. To keep it brief, the problem is whether to floor to the nearest significant figure, or to round to it, further reading here. Another issue was that the circuit network works in integers, and which way the fluid count should be rounded as it is outputted as a signal. This great inconsistency didn't sit right with Twinsen, so he took it upon himself to sort it all out. First thing was to decide how to round it, flooring it was an easy choice, and was already how most of the counts in the game work. But this led to a noticeable issue, pumpjacks would show as "0.0/s" when depleted. It was clear that at low values the system was not very intuitive, so next was to try adding a suffix to the low values, such as m for 1/1000 of a unit, and n for 1/1000000 etc. This would fit with the rest of the game, in that we have K, M and T suffixes for large numbers. There was some worry however, as several member of the team disagreed as to at which point the lower suffix should be used, and if it was even worth it for such a minor issue. After long discussion a more novel solution was decided on. From 0.15 all the fluid values in the game will be multiplied by 10. This was not as simple as changing a single variable though, as many many aspects of the fluid system interact with other parts of the game. For instance, hot fluid is consumed by steams engines to generate power, so they would need to consume 10x as much fluid, yet only generate the same amount of power. In total there were close to 50 different prototype values (recipes, items etc.) that needed to be adjusted, along with the engine logic and tests. The change will allow much greater precision in the display and logic of the fluids, along with mitigating the rounding issues and circuit network interactions. Kovarex's playthrough of the current 0.15 has been continued in good form early this week, with him making the transition from a main bus to a station/outpost based factory. Feeding his factories growing thirst has meant a lot of time is spent out in the wilderness securing greater and greater areas of land, to exploit for its mineral worth. As a consequence of the research overhaul, the alien artifacts are no longer used for research. This has been a really well received change, allowing players to finished the game without the need to engage the biters. The motivation for expansion is really clear in the game now, you need to expand to secure more resources. A secondary consequence of this is that sometimes the biters are in your way, so you get rid of them. However without the research needed them, the artifacts are only used in a few niche products, namely the fusion reactor and level 3 modules. The requirements of these few recipes was not very great, and very quickly the artifacts start accumulating in large numbers. When the player has his late game armor and weaponry, the clearing of biters nests becomes very quick, and it happens on a larger and larger scale. Such the number of artifacts you need to pickup increases. It becomes then that the process of clearing nests and destroying the spawners is very fast, but the time spent collecting all the loot becomes a tediously long and monotonous task after each victory. So after some thought, it was decided the alien artifacts that spawners drop are no longer needed. Their original purpose was to add them as a sort of 'RPG' layer to the game, such that combat would reward you with the artifacts to upgrade your character. In the latest state of the game this motivation just doesn't work, they serve more as a distraction than an addition to the combat. We hope this comes as good news to a lot of players, please let us know your thoughts on this, as it is quite a big change. Long time ago we have mentioned that we are working on new theme art series with external artist. 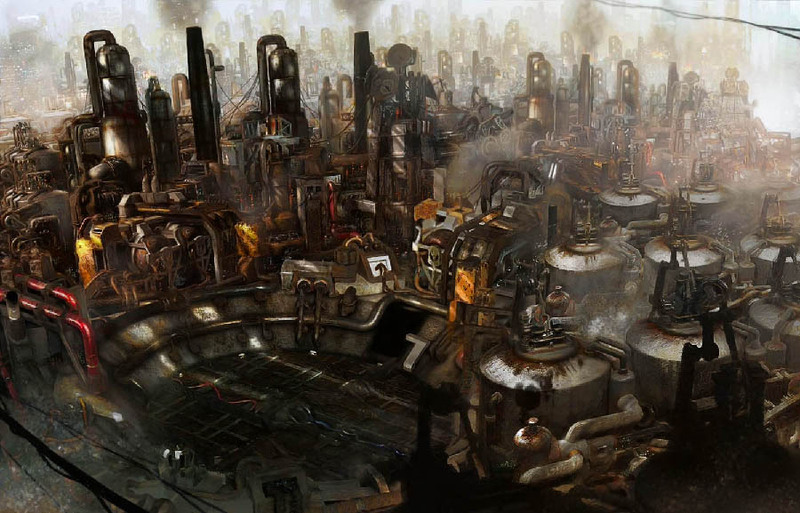 Unfortunately that cooperation has failed but we never abandoned the idea of having high quality Factorio theme art for online presence propagation, wallpapers or maybe printable posters one day. We were (well still are) looking to produce a series of about 12 theme pictures kind of telling a story of a factory evolution in the game. Recently things have started moving in this area again. We have teamed up with an italian artist Marco Turini living in Prague. Marco has rich experience in the comics industry (he worked for Marvel, DC Comics or Top Cow to name a few), he made official covers for some game-inspired comics (Assassin's Creed, Dark Souls and Deus Ex) and he has also experience from movie production both in Italy and Hollywood. So far it seems like we are a good fit. From his side, he is interested in the job both from the perspective of getting deeper into the games industry as well as general Factorio ambience. And from our side he possesses all the qualities to produce what we are after. Below you can check out a concept that Marco made as a testing project for us. This is NOT one of the pictures for the final collection, it is just a test to see whether our cooperation makes sense. That is why there is not too much sense in the picture with "cloned" objects in line. However the style is what matters here and that we find very fitting. As always, let us know about your thoughts on our forums.